With all the political turmoil taking place in Tokyo this week, Japan’s central government has announced plans to delay talks with Washington on revising and finalizing the U.S.-Japan Defense Guidelines. The announcement comes as no surprise given the political vacuum caused by the dissolution of the Lower House of Representatives and the upcoming snap elections to be held on December 14. Indeed, delaying the revision process has been discussed publicly for some time. According to the Jiji Press, Tokyo hopes to have the guidelines completed by spring of 2015, several months after the year-end deadline. Top officials from Japan’s Defense Ministry Policy Bureau, led by director-general Tetsuo Kuroe, are set to travel to Washington this weekend to hold talk with U.S. defense officials. The upcoming overhaul of the defense guidelines will be the first by the two countries in nearly 20 years. In October 2014, the U.S and Japan released an interim report outlining the security challenges that will for the foundation of their cooperative grand strategy in the Asia Pacific. The new guidelines, which were last revised in 1997, will be updated to reflect the decision by Prime Minister Shinzo Abe’s cabinet to reinterpret Japan’s constitution allowing the pacifist state to participate in collective self-defense should one of Japan’s allies come under attack. Abe’s decision to revise the constitution, while controversial, marked Japan’s foreign policy shift since the end of World War II. 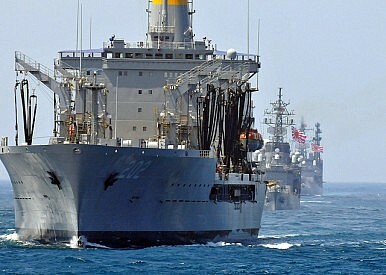 The move will take pressure off the United States by allowing Japan to do more for its own defense as well as contributing additional resources to maintaining regional stability, which is something cash-strapped Washington has been pushing for over the past several years. According to the interim report, the new guidelines will emphasize “seamless, robust, flexible, bilateral responses” to “promote, a stable, peaceful, and prosperous Asia-Pacific and beyond.” At a time of heightened tensions between Japan and China over the sovereignty of the Senkaku Islands, the guidelines, while not explicitly stated, will also seek to address China’s military rise and maritime expansion efforts in the South and East China Sea. Although Washington and Tokyo have expressed their intent to speed up the revision process, the delay may have been planned for some time. As early as October 23, a Japan Times report cited anonymous U.S. government stating a delay was being considered to allow more time for “further consultation between Tokyo and Washington.” According to the report, more time is necessary to work out the kinks of the recent constitutional revision and determine exactly what role Japan’s Self-Defense Forces will play in coordinating and contributing to regional security efforts with the United States. On November 7, Reuters reported a delay would take place to allow the Abe government time to shore up political support for the constitution revision. Additionally, Abe doesn’t plan to submit legislation regarding the defense guidelines to parliament until early 2015. Whether or not the delay had been planned before hand, it appears, at least for the time being, that Japan’s domestic political turmoil and economic woes are trumping its regional security challenges.